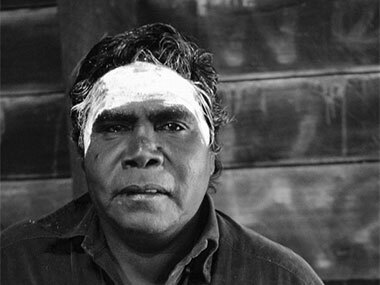 Djambawa Marawili, Madarrpa clan leader from Blue Mud Bay, artist and political leader of ANKAAA Aboriginal Artists' Network. The distressing efforts of governments – Federal, State and Territory – to escape their responsibilities for remote Aboriginal communities – out-stations or homelands – was, of course, personified by the immortal words of our PM that living in such inconvenient places was just a “lifestyle choice”. How can he even think of himself as 'Prime Minister for Indigenous Australia' when he reveals such a shallow understanding of the role of these communities in maintaining culture, language, health and ceremony and in producing the art that communicates those things most effectively to the wider world? "The ANKAAA Board stands behind the importance of homeland communities. And affirms the vital importance of the ancestral homelands to Indigenous art, languages, law and culture. 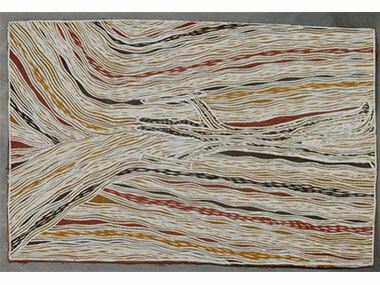 And to the Australian Indigenous Art Movement". I urge the government and wider Australia to respect our Indigenous cultural knowledge base as an asset of inestimable value for Australia and the world; for building strong and healthy livelihoods for my peoples; and fostering effective empowered participation in the mainstream. As an Indigenous artist and cultural leader living in my homeland on ancestral Country in North Australia, I speak for my own and other homeland communities to remind people we are the knowledge holders and caretakers of this Country. In our regions, on our Country, we are the people who can speak for this land and sea. With our internationally recognised Australian Indigenous arts industry; ranger programs; and many developing Indigenous businesses on Country – like cultural tourism, fishing initiatives and business products such as bush food, medicines and furniture production - we can draw on our deep and living knowledge of country and culture and be experts. We are the archaeologists and anthropologists. Our elders are passing on traditional knowledge in ‘Yolngu’ and ancient Indigenous university systems, and languages which are still strong and real and rolling on. The time is really short now for Australia to support us in caring for these invaluable traditions needed by coming generations, before it’s too late and they are lost. Our dynamic contemporary northern art is grounded in this knowledge, which Australia has turned away from for too long. We want Australians to properly understand that our traditionally grounded contemporary art is not principally about beautiful objects; but with ancient patterns and designs, shares our living ancestral understanding and specific connection to Country. As homeland and community people living independently on our Country, we feel confident and happy and strong. There are no drugs or bad influences coming into our lives while we are living on the Country. And we are also building skills to live in the mainstream world. We especially want government to understand it is important not to force us to leave our Countries again and instead to support us. We were already taken away once to live on missions, and we walked back to Country to rebuild our knowledge and culture. We wish government could understand that we are much stronger and can be much more productive living on Country than living elsewhere. And to work with us patiently, to support us in further developing skills needed to build businesses and jobs here. The community Art Centre network across our regions in northern Australia is an outstanding example of contemporary Indigenous agency. Our inherited patterns and designs are our identity and also a weapon, title deed, ‘talking stick’ and means of economic empowerment. Please join to walk with us. For more information on the impressive work of ANKAAA - along with the productivity and accomplishments of the art centres and communities they represent - please see their latest volume of the Arts ANKAAA Backbone from December 2014/January 2015. The Sacred Crocodile, Baru, metamorphoses into myth in one of Marawili's barks.